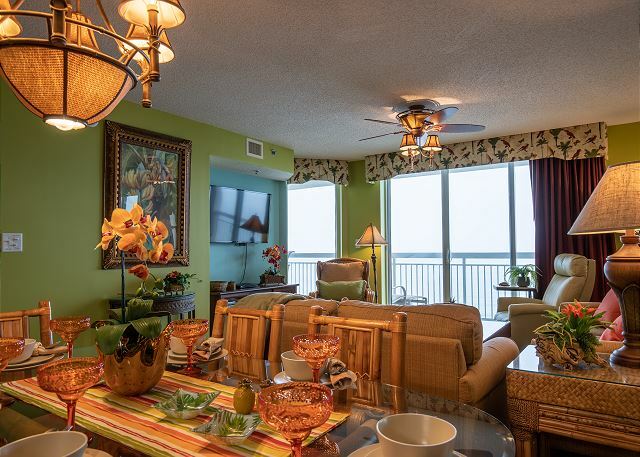 This beautiful three bedroom three bath oceanfront condo in Crescent Shores is ready for you. The 26', ninth floor balcony gives stunning views of the beautiful Atlantic Ocean and the white sandy coastline and is accessible from both the living room and the master bedroom. The well-appointed kitchen offers granite countertops, and new slate appliances include an electric range, refrigerator/freezer with ice maker, microwave,dishwasher, as well as a full-size washer and dryer off the kitchen. 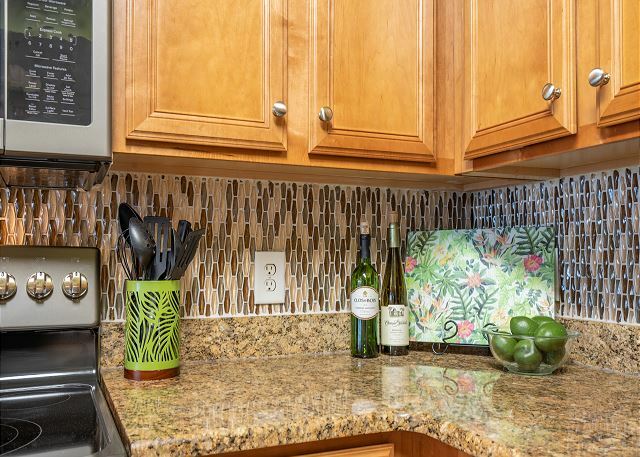 The cabinets are well stocked with plenty of dishes, glasses and silverware Additional appliances include a toaster oven, electric griddle, large crock pot, 2 blenders, a hand mixer, pots, pans and baking dishes round out this chef's gourmet kitchen. The coffee bar moves coffee making out of the kitchen, allowing guests to serve themselves without interrupting the cook. A new Ninja 12 cup coffee pot, a new Keurig large reservoir single cup maker and an electric kettle are all available on the coffee bar. The removable reservoirs on the coffee pots make the relocation from the kitchen to the coffee bar a breeze. The living room features a mirrored wall that doubles the oceanfront view. Plenty of comfortable furniture provides seating for viewing the 50" smart flat screen cable TV and DVD player. Free wireless internet access is available in the unit. A dining table for 6 and a 3-seat breakfast bar offers plenty of room for your group to eat together. 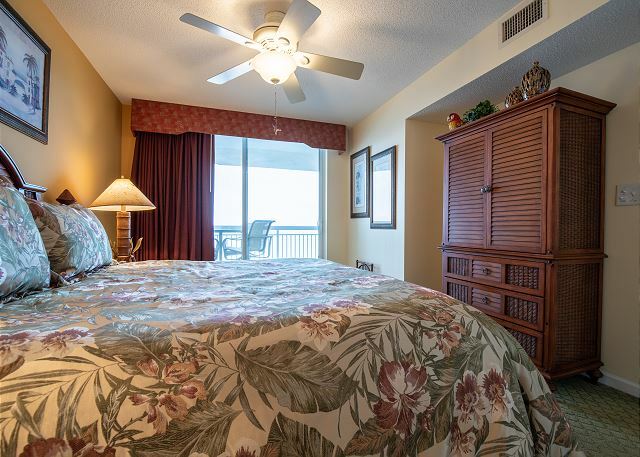 The oceanfront master bedroom offers a king-size bed, 2 nightstands and and cable television. 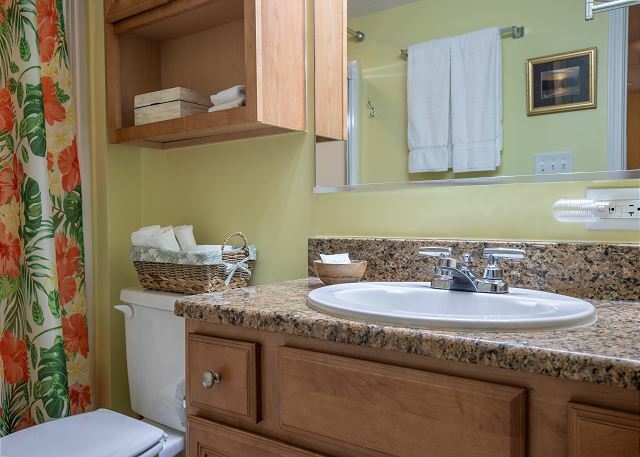 A walk-in closet leads to the master bath with granite counters and double sinks. 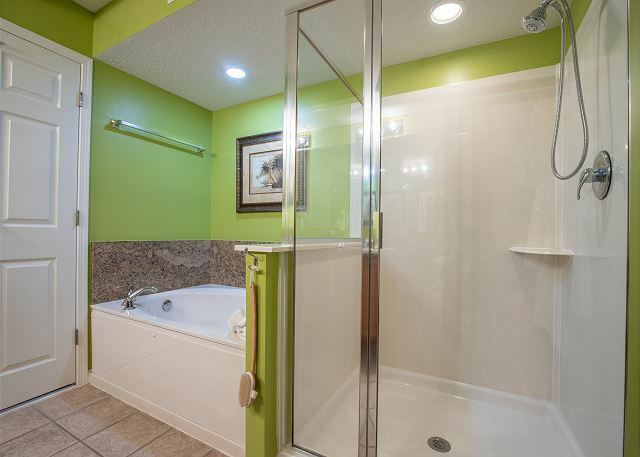 An oversized stand up shower with an outstanding shower head along with a jetted whirlpool tub awaits you. Each of the two guest bedrooms offers 2 queen beds and their own bathrooms. 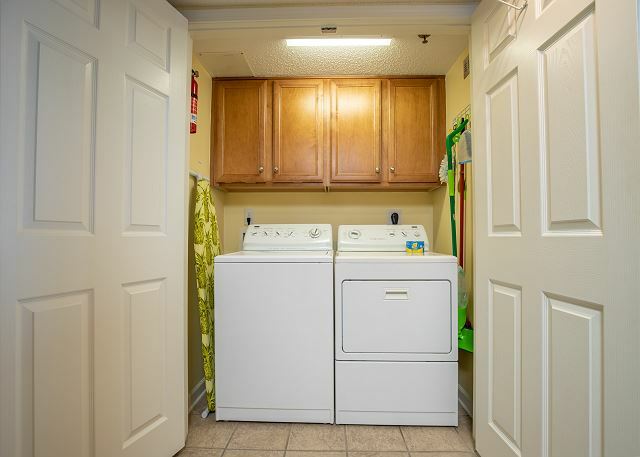 Each bathroom offers tub/shower combos, as well as conveniences such as multiple towel racks and retractable clothes lines. 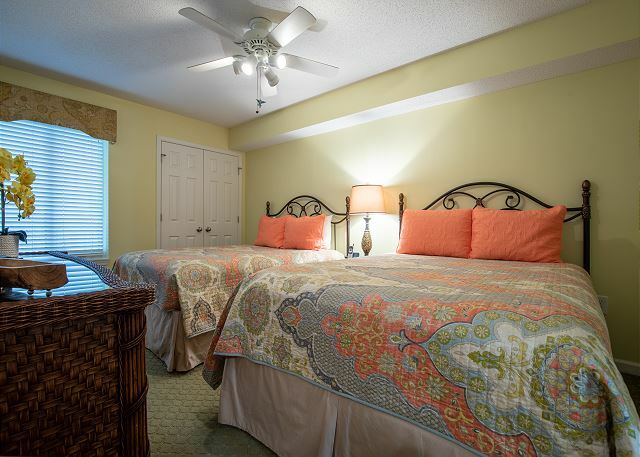 Bedrooms include ceiling fans, suitcase stands, new bedding, pillows and blankets. Beds are encased in waterproof protectors covered by quality mattress pads and made prior to your arrival. Linens are included in your rental. Guest bedrooms have flat screen TVs and DVD players. This 1700 square foot unit is tastefully decorated. Much of the furniture pieces are island style with bamboo and rattan inlays. A tropical theme is carried through the artwork, fabrics, floral arrangements and lighting. The foyer, kitchen and baths, offer ceramic tile, while bedrooms, living and dining rooms are carpeted. Changes in 2018 include--New heating/air conditioning unit and water heater. Custom drapes on the sliding glass doors, new range, microwave, dishwasher and refrigerator, glass tile kitchen backsplash, many light fixtures, a new leather recliner and side tables were added to the living room and the entire unit was repainted. The owner has upgraded this unit substantially in 2018 with a focus on making it as welcoming and practical as possible, adding many touches like hanging hooks in each bedroom for towels and beachwear. 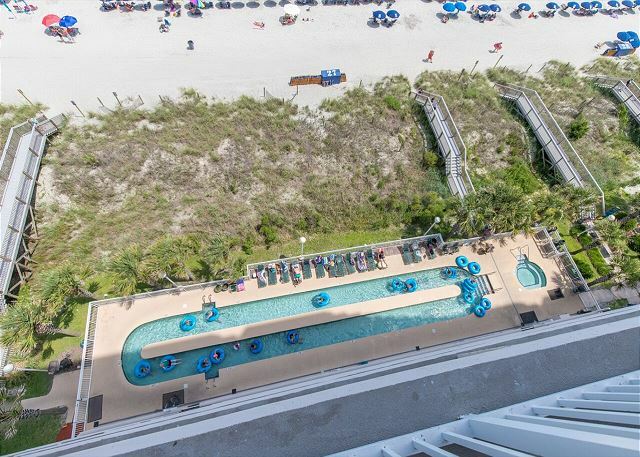 The amenities at Crescent Shores include an outdoor pool, 2 hot tubs, lazy river, kiddie pool,charcoal cooking grills, heated indoor pool, outdoor showers and a fitness area. A parking garage offers covered parking. On site security is also provided. BEACH ACCESS: A short boardwalk over the dunes and you have arrived for fun in the sun! Beach umbrellas and chairs are available for rent directly in front of the condo on the beach. Other adventures are also available for purchase directly on the beach. OUT AND ABOUT: Next door is Molly Darcy’s an oceanfront pub with indoor and outdoor seating, bar and pool tables. Within walking distance are a beachwear store, convenience store and an ice cream stand & grill. Barefoot Landing is close by, with the Alabama Theater, House Of Blues, Alligator Adventure, Duplin Winery plus over 100 shops and restaurants. No Cold or Snow, Just Beautiful Views! This condo is great—very clean! We are snowbirds and have rented this condo for three months for the past two years and we have it booked for next year. 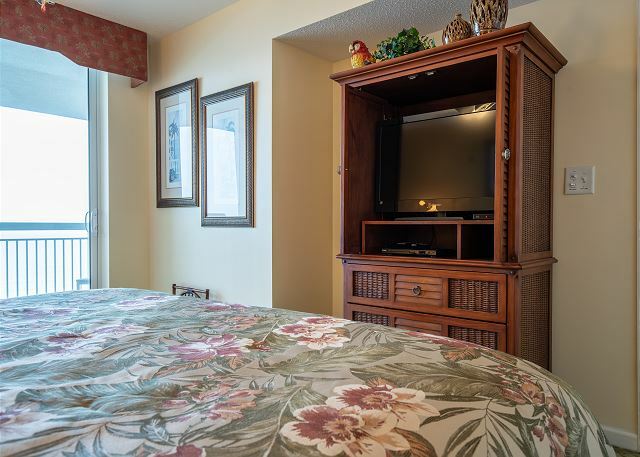 It has everything you need—well equipped kitchen, comfortable beds, great tv’s, and the view is awesome. We love the balcony that overlooks the ocean with its high top table and chairs so your view is not obstructed by the railing. 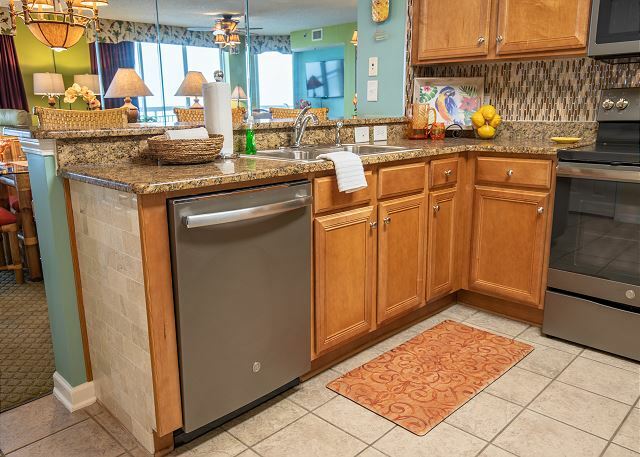 The owners are excellent in keeping the condo updated—new kitchen appliances, new paint, back splash in the kitchen, new bedding, new furnace and air conditioner. The management company is easy to work with and their linens are wonderful. The location is great close to restaurants and entertainment. Looking forward to next year! WOW! Thank you for that perfect score! We are happy when everything goes right and we can pat ourselves on the back for making another travel group as happy as possible. Every detail you mentioned is what we would want to highlight for others to be able to make their vacation destination, Crescent Shores #902. It's even better coming from a satisfied guest than just reading it on the web-site description. 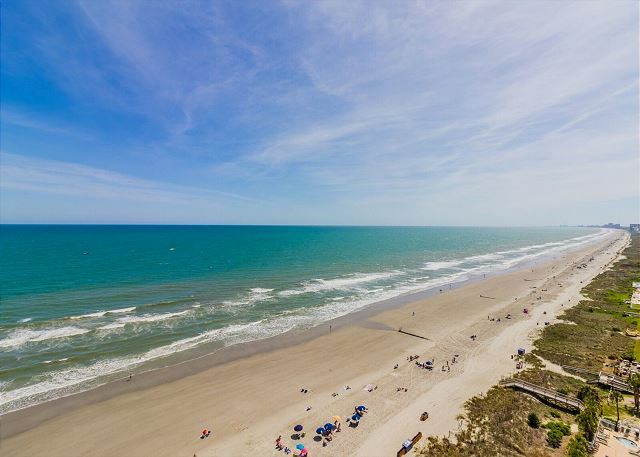 As you mentioned, mild winters on our SC beaches can be the perfect escape from the harsh weather of home -- it can be the ideal home away from home. The owner of this unit has impeccable taste and welcomes their guest to a great experience, winter or summer. Thank you again for sharing. This condo is perfect. Great location in N. Myrtle Beach. Close to a nice variety of restaurants and shopping. It has everything; kitchen well supplied, the beds very comfortable (slept great),more than enough towels, great ninth floor ocean view and the décor has been updated and is bright and fun. (I love the parrots.) A nice tropical flavor. The owners have definitely seen that our stay was comfortable and enjoyable. Thank you. We will definitely return. Had a great time. The accommodations were great. Very clean and well stocked with everything to make for a great stay. Thank you for taking a minute to leave a great review. The attention to detail is a top priority to this owner and they will be proud that you had a wonderful stay in their condo. There are more plans underway for a few more upgrades and improvements this fall. The Crescent Shores complex is a favorite destination because of the location and amenities. 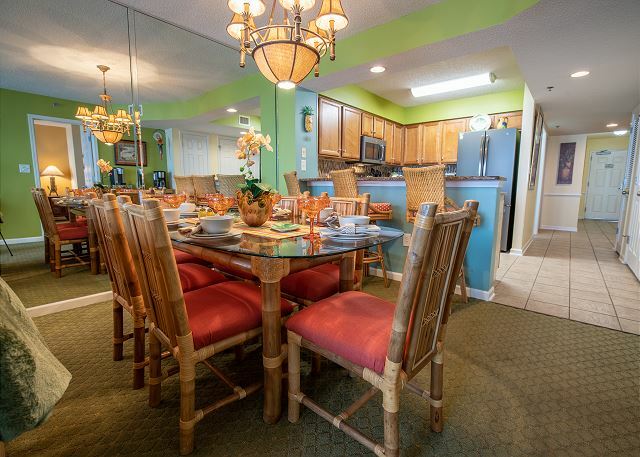 There are restaurants, shopping, entertainment venues and attractions, as well as limitless golf courses to please everyone in the group, and all within five to ten minutes drive of our great little beach town. You cannot go wrong with a relaxing stay at this beautiful vacation resort. Thanks again for choosing to stay with us at ODVR. Thank you for that short and sweet review. It's the easiest way to say that you had a wonderful time and the owner will be delighted that the condo met your expectations. 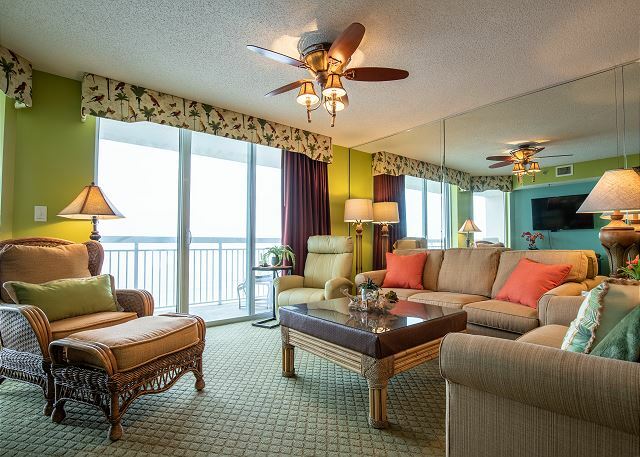 This Crescent Shores gem offers guest the best of ocean front luxury and comforts. 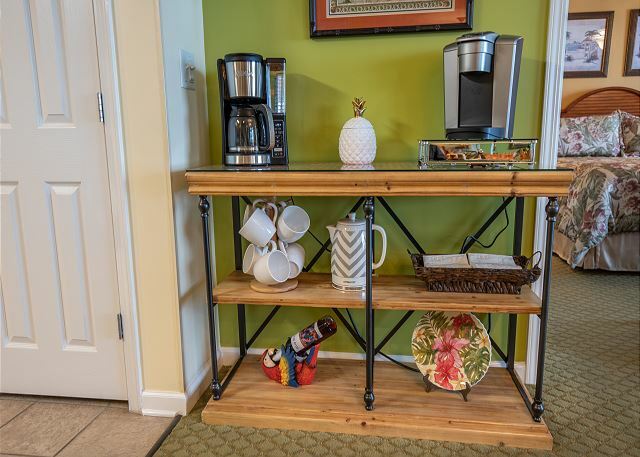 Like they say, "it's all in the details" and this condo is newly remodeled and well stocked with essentials to make your stay a first class experience. The location of Crescent Shores makes it a family favorite because of the great poolside and gym amenities, as well as, a local restaurant, souvenir shop and ice cream stand on each corner, just close enough to talk a stroll and get back to the beach in minutes. Thank you kindly for the excellent review marks and let us know when you are ready to return. The condo was wonderful - clean, nicely decorated and furnished well. We had no concerns at all about our lodging during our stay which allowed us to just enjoy our surroundings and our vacation. Loved the location - close to a convenience store, ice cream and a pub/restaurant. Short drive to Barefoot Landing and downtown North Myrtle Beach. Great place, great view, great time. Rental properties are not always what pictured or described, this one is. We had everything we needed in the kitchen, the beds were very comfortable and I am picky about my bathroom and it was nice and clean. The entire condo was very clean. The owners have added a personal touch that made you feel "at home". 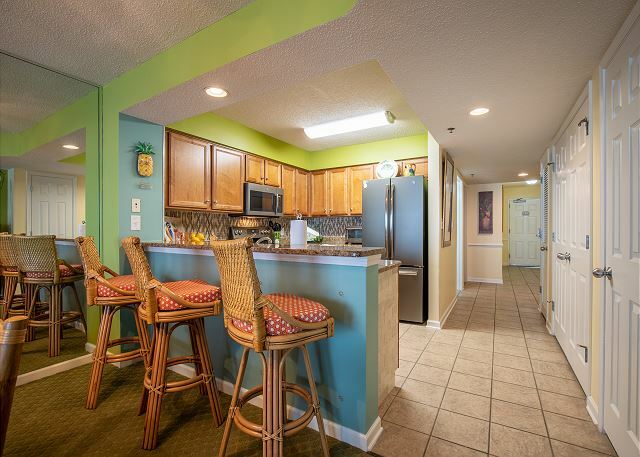 Location is great as it is away from the more crowded areas of Myrtle Beach, and still convenient to restaurants, shopping and activities. Parasailing activity right there on the beach. 9th floor view is great. We are looking forward to returning and bringing more family and friends. Thank you for the perfect review. 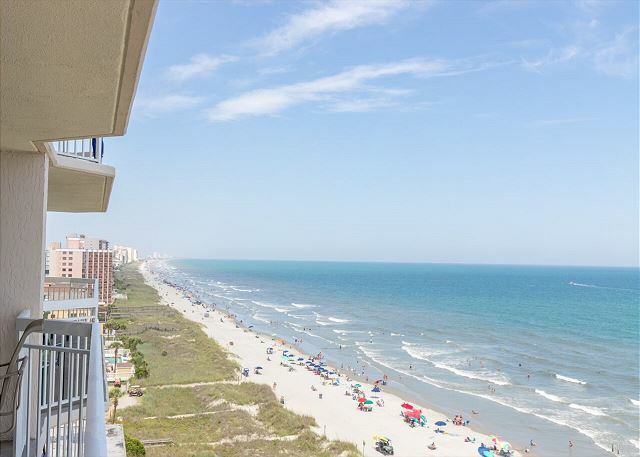 The owner will be thrilled that you found everything to be "GREAT" and that the details they have put into creating the perfect beach getaway were appreciated. 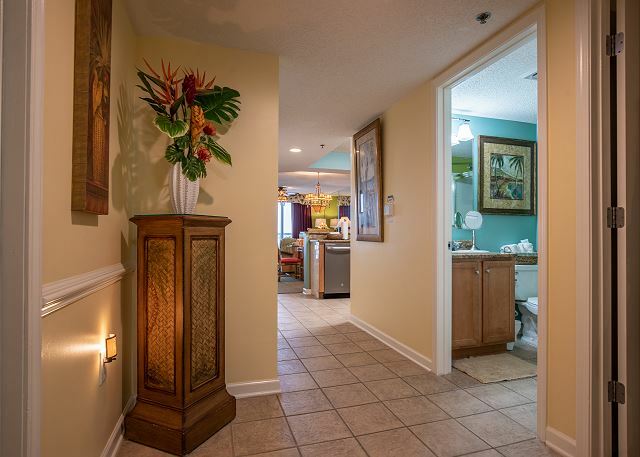 The pictures for this condo were just taken in June this year, so what you see is exactly what you get, and then some. The condo has been completely refreshed with new paint, new bedding, and newly re-stocked with kitchen necessities. 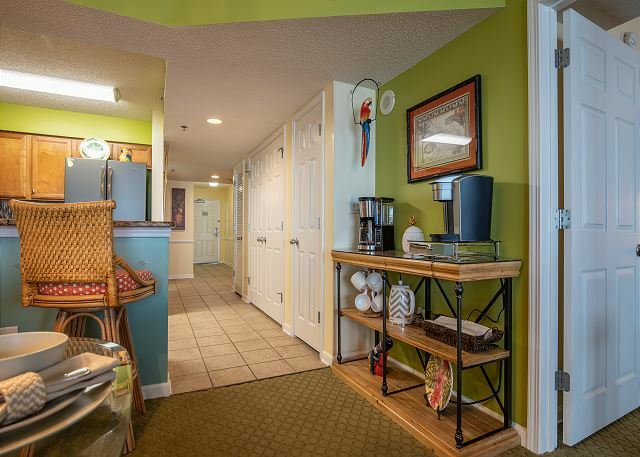 Your thoughtful description of the area is exactly what every guest wants to know about the Crescent Shores location -- that the complex is in the heart of all that our great little beach town has to offer. Crescent Shores does provide the best family friendly amenities, too, from outdoor and indoor pools, to gym and grilling stations. We hope you will be back and with more family and friends. The check-in was hassle free, which we needed after a long trip. The mgmt company was very efficient. The owners left detailed information that answered all of our questions about the condo, i.e. WiFi, fans, lights, etc.There were so many personal touches that made us feel right at home. It was very clean, decor was exactly as pictured and furniture was very substantial. The beds were very comfortable, rooms nicely decorated , kitchen had everything we needed to prepare meals, location was great, with a restaurant next door and a spectacular view. This was a perfect location right on the beach. The kids loved the lazy river! If you’re looking for a place to relax, enjoy the morning sunrise and more, this is it. I would strongly recommend this property and we will definitely be back! The owners and the management company attended to every detail which made our vacation fun and easy. We certainly appreciate the 5 star review for this condo and the kind praise about our staff at ODVR. We are grateful to hear positive feedback when we get it right and have helped to create wonderful beach memories for our guests. The owner has worked hard this season to remodel and update this condo and it shows in every aspect. 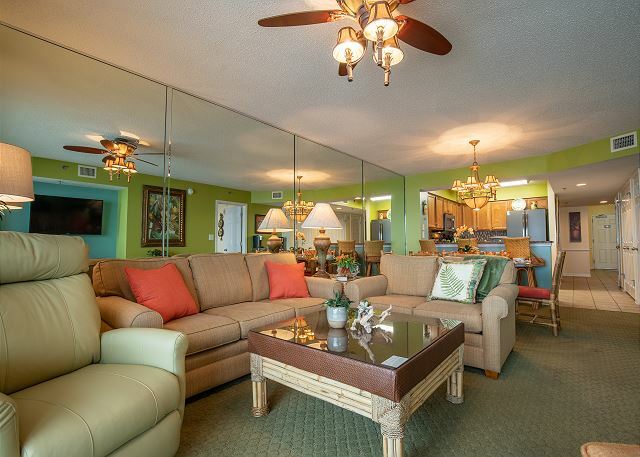 The spaciousness of this condo allows everyone to have room to congregate in the family area for meals or retreat to their own quarters for a little relaxation time. The huge balcony offers enough room for idling away with a book or a sunset meal at the best seat in the house. Crescent Shores is a top tier resort complex with all of the extras to make everyone happy in the group, young and old. Thank you for sharing your family experience with us and we hope you will return to our great little beach town.